Communication around GSA’s 70th annual Fashion Show and the exhibition celebrating it gave the Archives and Collections a unique opportunity to develop our collection of fashion and textile related material. We’re keen to continue to add to this over the coming months and are still accepting donations of items which were showcased at GSA Fashion Shows throughout the School’s history. 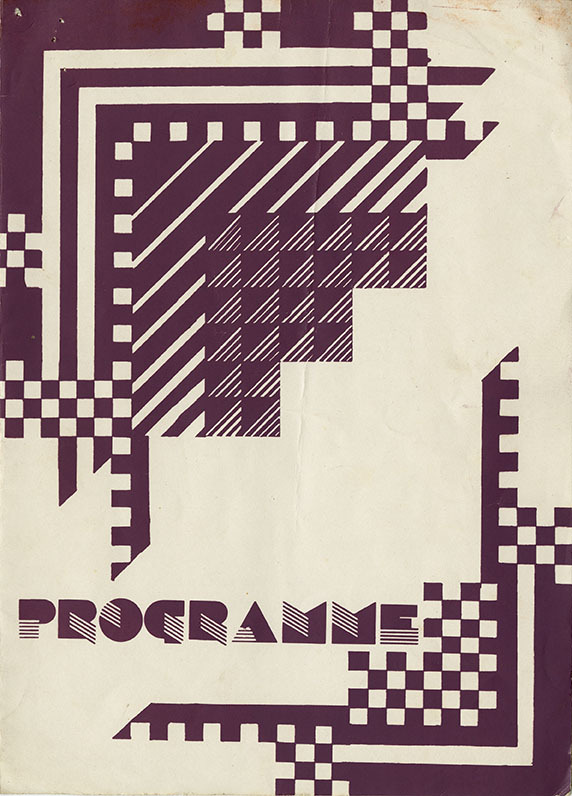 GSA Fashion Show programme c1970s. Donated by Lyz Armstrong. Archive Reference: JAC/43. Like the majority of the material in our collections, these items will be made publically accessible and we hope they will continue to inspire current GSA students as well as anyone else who is interested. Please get in touch with us at archives@gsa.ac.uk if you have any Fashion Show related material that you would like us to look after. In this blog post, we’ll give you a flavour of some of the material that was collected in light of the 70 years exhibition. From a suitcase bursting with sparkly fabric lengths to photographic evidence of the highest necklines imaginable it’s certainly a varied mix. However, we’ve narrowed it down to a few pieces which we think you’ll enjoy getting a sneak preview of. The first are these three beautiful outfits donated to us by Judith MacKechnie which were chosen to feature in the press in May 1975. 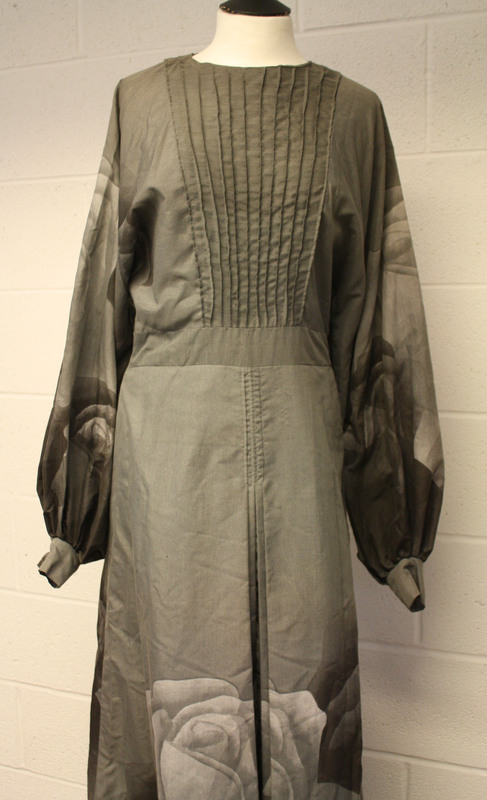 Two models were photographed wearing these in the Mackintosh Building’s “Hen Run” which demonstrated the voluminous quality of the garments. 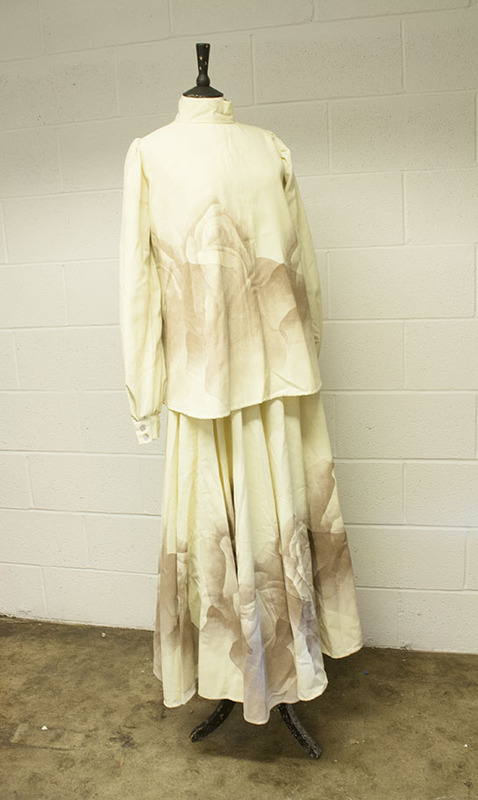 Judith MacKechnie dress for the GSA Fashion Show in 1975. Archive Reference: JAC/61. 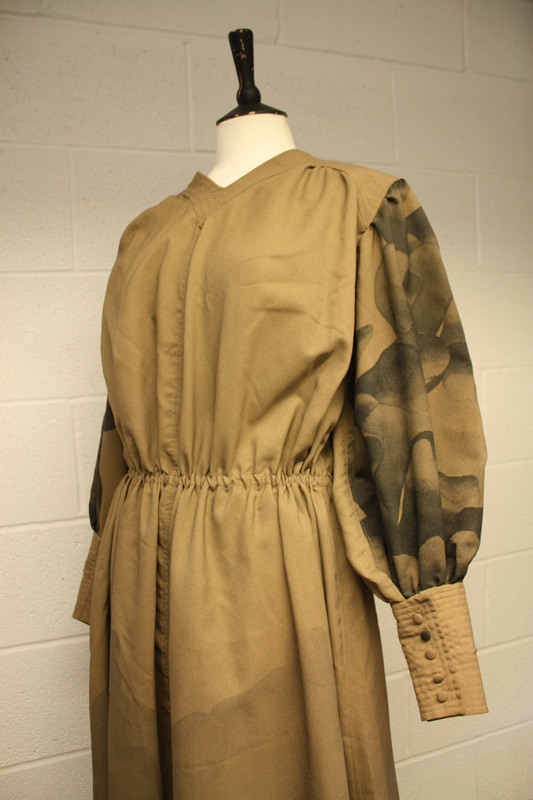 Judith MacKechnie tunic top and skirt for the GSA Fashion Show in 1975. 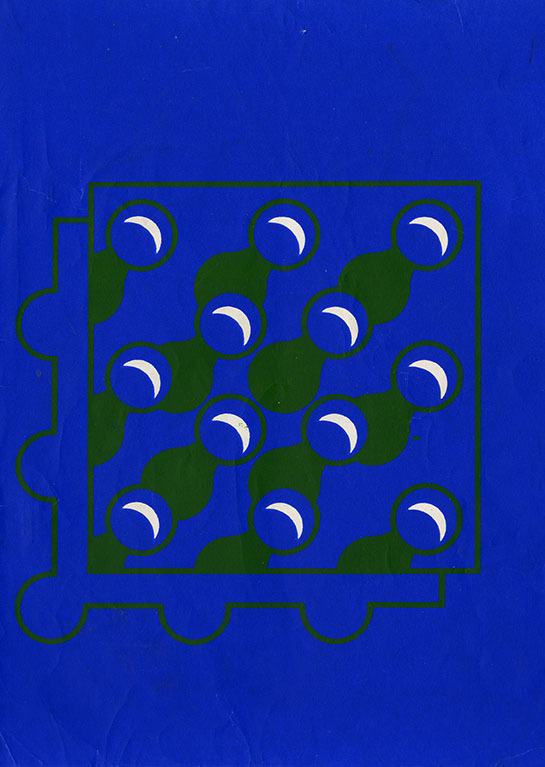 Archive Reference: JAC/61. In producing these pieces, MacKechnie hand dyed wool and crepe fabrics in subtle shades of brown, grey and salmon pink before printing reduced opacity rose motifs on top. The way the garments have been constructed allows them to move elegantly with the wearer. 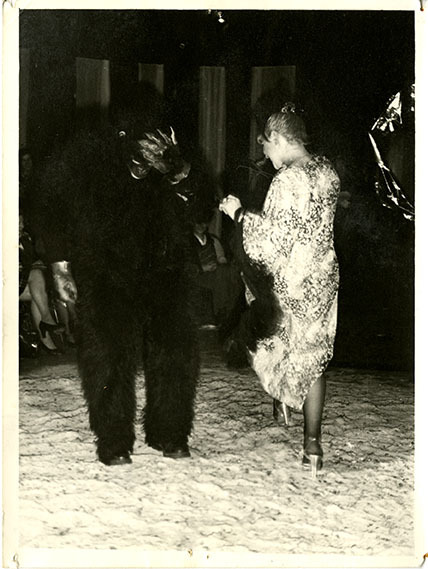 The next item is this rather bizarre photograph featuring an embarrassed looking gorilla! This was taken during the 1977 Fashion Show and was donated to us by Lyz Armstrong along with several garments she created for the fashion show in 1979. Among these is a sheer georgette kimono coat, a satin strapless sequin top and a satin pillbox hat with a veil. All of these have recently been assessed by textile conservators to give us expert advice about caring for them. Lyz was also kind enough to donate GSA Fashion Show Programmes for 1977, 1978, 1979 and 1980. Our printed ephemera collection didn’t previously have these so it’s great that we’ve been able to fill the gaps. 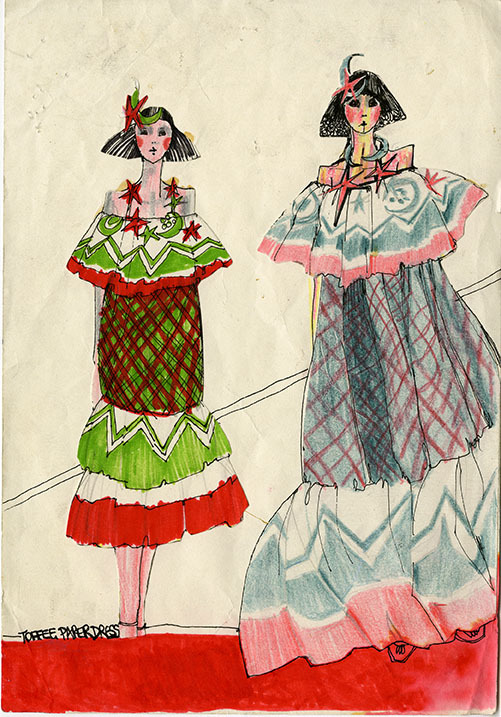 Last but not least is this original design sketch of two fabulous “Pennie Daintee” dresses created and donated to us by Sheila MacDonald who produced these as a talented first year Textile Design student in 1976. Written at one illustrated figure’s feet are the words “Toffee Paper Dress” suggesting that the full collar and skirt of these designs has been cleverly influenced by sweet wrappers. Sheila also donated the dresses themselves which are so full of life that they are currently threatening to spring out of our archive stores! Follow our activity on Instagram for images of these in the very near future.